The Monthly U.S. 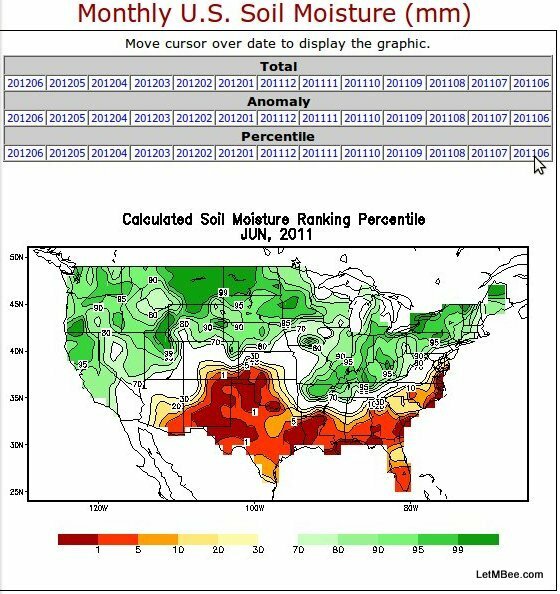 Soil Miosture – Last 12 Months data. Currently this is displaying June 2011. 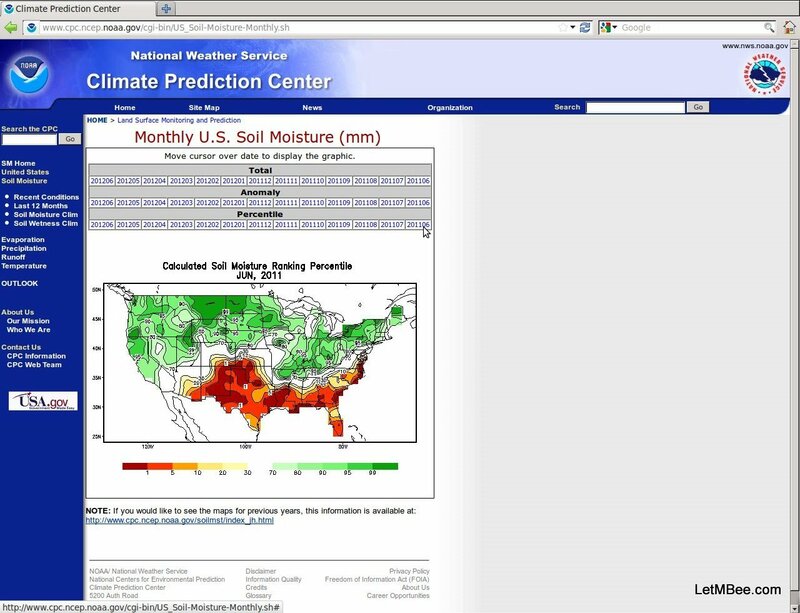 The second tool I utilize to look at precipitation and weather is from the National Weather Service. It is called the Climate Prediction Center. I look at it less for prediction or even current conditions, but more of a comparison and overview over the last year. The page I use the most is the Monthly U.S. 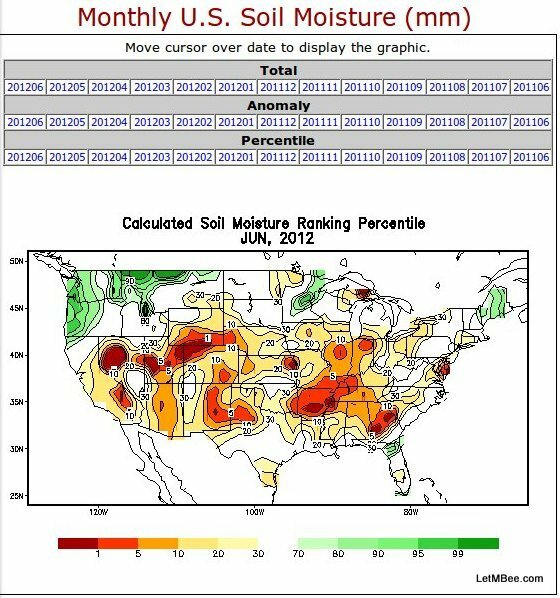 Soil Moisture – Last 12 Months. A warning before you start snooping around on this site. I am new to it in 2012, every time I visit I find something new. I don’t want to be blamed for hours of lost productivity. Also if you don’t enjoy the use of the metric system don’t click on the link. If you look in the bar at the left hand side of the site under Soil Moisture you will see some bulleted items: Recent conditions, Last 12 Months, Soil Moisture Clim and Soil Wetness Clim. Of those I will look at recent conditions some, but mainly I look at Last 12 Months. It is the bullet I linked to above. In this section I look at the tabs Percentile and Anomaly most. You can move your mouse from right to left and see the progression of the months and how the soil moisture conditions have been changing. Currently under the Anomaly section you can see that last year in June, Eastern Indiana was at 40 to 60mm above the average from 1971-2000 (wetter than normal). Now if you go to June of this year you will see an amazing difference -60 to -80mm (Holy COW it’s dry!!!). Under the bulleted items you will see Evaporation, Precipitation, Runoff and Temperature. If you click on any of these options new bullet points will appear and you can look at them. Under Precipitation I like to look at the bulleted item Last 12 Months. There are displays of Land Surface Monitoring and Prediction in this area with the same headings: Total, Anomaly, and Percentile. 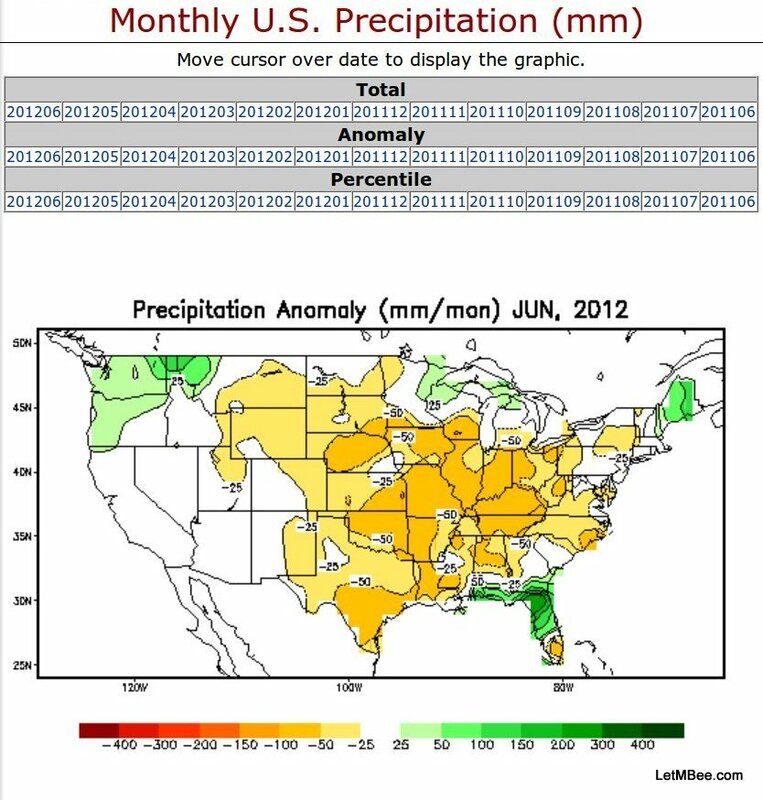 The anomaly for June 2012 where I live is in the -50 to -100 mm/month range. All of this data is relative and it can take you a while to get to the point where you can interpret it. I have spent hours and hours on the site and still find something new each time I visit. I don’t know how accurate the information is for certain over my house. Since I have been following it the trending info seems accurate. I do question anyone or anything that says I got 25-50 mm (0.98-1.96 inches) of rain last month. It must have evaporated out of my rain gauge before I could check it. The glossary at the bottom of each page can help you if you don’t know what some of the terms mean. Last year I had a poor year for honey production. It seemed that every time a bloom occurred rain would come and destroy them. I believe too much rain can be VERY bad. Too little rain is bad to but maybe a little less bad. This tool leads me to believe that my honey production has more to do with when the rain events occur. As delicate flowers can be destroyed never to return. It can be a double edged sword. Give this site a look and bookmark it. Every month or so take a look and see what is going on. What do you think? Have you used this or other tools that I am not yet aware of? Leave a comment. This entry was posted in Posts and tagged bee, beekeeping, Indiana beekepeing, Jason Bruns. Bookmark the permalink.